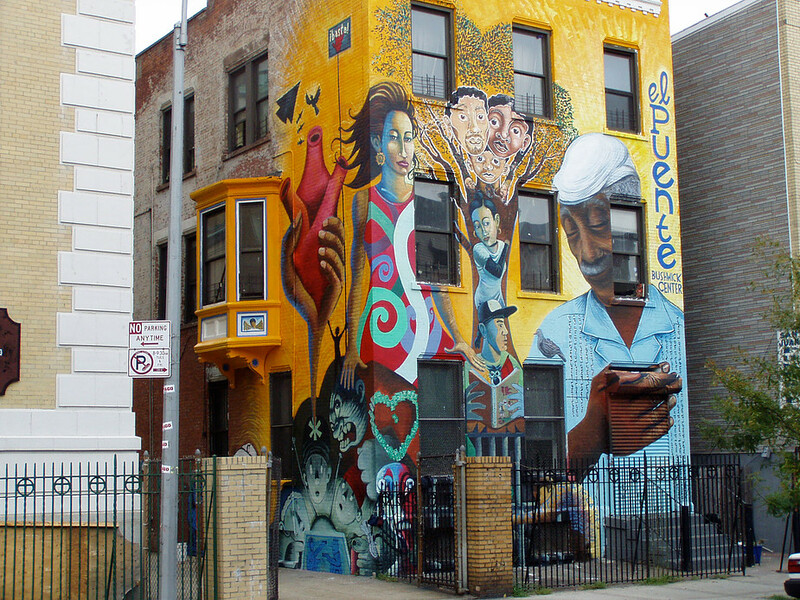 El Puente operates six multifaceted Leadership Centers in North Brooklyn. Using a holistic approach to leadership training, El Puente’s signature Membership Model for creative youth and community development integrates social action within a bilingual comprehensive, skill-based program that includes: academic enrichment, performing and visual arts, sports, health and wellness, one to one mentoring and internships. Youth and adult members of the El Puente Leadership Centers engage in community development projects as well as citywide/national social justice campaigns that support and develop their leadership and have a sustainable impact on global issues as expressed in El Puente’s Platform for Human Rights. El Puente Beacon Leadership Center at Middle School 50 opened in 1998. It is a multifaceted comprehensive program that runs year round and serves approximately 1,300 participants that include children, teens and adults. The Center offers a comprehensive bilingual after school program for primarily middle schools students, with a particular focus on high school transition for youth and their parents, and an evening teen program that includes a PAL Teen Impact Basketball program and break dancing. For adult members the program offers ESL and Spanish GED classes as well as Salsa classes. A special feature of the Beacon program is its pre-professional Saturday Arts Academy for youth 6-13. Classes include ballet, street jazz, acting, breaking and visual arts. 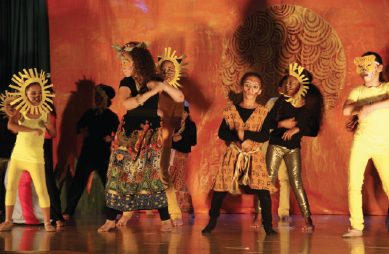 The Beacon also runs a comprehensive skills based pre-professional summer arts day camp for youth ages 6-13. El Puente Bushwick Leadership Center is a vibrant, safe and nurturing community for young people (ages 13-21) and their families. It offers a comprehensive year round program that integrates El Puente’s signature Membership model that focuses on holistic leadership development, one to one mentoring and project based learning. An array of skills based activities focus on achieving educational mastery and transformative social action. Participation in the arts is an essential part of the Center as a powerful tool to educate and organize the community. 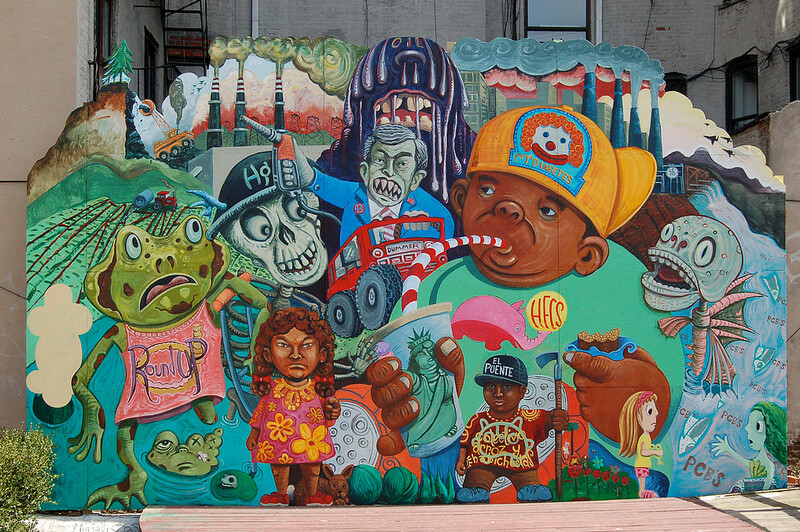 “Time Flies: A History of Bushwick” and “A Community Rises: Creating a World without Domestic Violence”, two powerful community murals painted by the El Puente Muralistas and Bushwick members are part of Bushwick’s walking tours and are an inspiration to community residents. Independence Towers leadership center in south Williamsburg specializes in empowering youth through teaching arts and culture, as well as providing a safe space to cultivate their unique skills and talents. Independence offers a wide range of classes and activities. For elementary grade youth, it offers Homework Help, Cultural Arts, Technology, H.I.P., and Activism, as well as clubs such as Comic Book Club, Game Room and Dance. For middle and high school age youth, it offers evening programming on a daily basis, where they can take classes such as Dance, FlexNYC, Basketball, Mentoring, and Youth Council. The Williamsburg Leadership Center (WLC) is El Puente’s flagship holistic youth and community development program that began in 1982 and still operates out of its original headquarters- an inspiring renovated former Catholic Church building in the Southside of Williamsburg (Los Sures). In the last three decades, the Williamsburg Center has been the hub for much of El Puente’s legacy of ground breaking and change making programs, advocacy and initiatives. It was the home for the El Puente Academy for 13 years. In addition, it remains the premier Arts and Cultural Center for the organization with a professional dance studio, art room, and presenting stage, fully equipped with a sound system and stage lighting. In 2008 El Puente was asked to develop a youth/community development program at NYCHA’s Taylor – Wythe Houses, as part of DYCD’s Cornerstone Initiative. Since then, El Puente’s Leadership Center at Taylor-Wythe has emerged as a powerful “bridge” builder among the diverse Latino, African American and Hasidic residents of those NYCHA houses. The Center runs programs year round and offers a comprehensive youth day camp program (ages 6-12) during the summer. It also hosts special events, arts showcases, cultural celebrations, community forums and workshops focused on social service support/civic engagement such as immigration, health and wellness and voter participation. In 2015 El Puente was asked to develop another youth/community development program at NYCHA’s Johnathan Williams development, as part of DYCD’s Cornerstone Expansion. Since then, El Puente’s Leadership Center at Williams Plaza has emerged to focus on nurturing and inspiring leaders for Peace and Justice through the scope of wellness.The center will focus on providing an array of holistic activities such as movement & exercise, healthy food education, and service opportunities among others. Due to the creative focus on Holistic Wellness, leadership staff has created a plethora of activities and groups while utilizing youth/community leadership development programming that includes a comprehensive but holistic after school program for elementary youth, a fraternity/sorority-like Middle School group and an evening teen program focused on college/career preparation, the arts and community service. © 2017 El Puente. All Rights Reserved.